In the beginning moments of Wolfenstein II, B.J. Blazkowicz is cowering in a closet. His father has just come home and is threatening to beat his son for playing with a black girl. His mother pleads and begs as he goes on a threatening racial tirade, blaming minorities for his financial problems, before picking up, throwing, and kicking the dog and knocking out his wife. The doors are thrown open, and there he glowers over B.J., swearing to teach his son how to be tough. Suddenly, the scene is alive; prompts on the screen tell you to pick up a vase and throw it. He corners you, screaming at you for being weak, as you fumble and try again. It’s useless. He overpowers you, and in the next sequence, ties your wrists together while he berates you, again, for your weakness. He pins you down to a slab of wood and places a gun in your hands, beckoning you to shoot the family dog. If you misfire, he rips the weapon from your hands and kills the poor animal himself. Wolfenstein II, so far, has not been as emotionally redemptive as I thought it would be. After playing this sequence, I had to put the controller down and catch my breath. I’ve played many games in the past decade and many have made me cry, but this was different. I have to ask if it goes too far. It goes without saying that dramatic scenes, in any medium, serve a greater narrative purpose. What, then, is the purpose of Wolfenstein’s celebration of violence? Originally, it was a great cover for the criticism aimed at the emerging shooter genre. After all, who could argue against killing history’s greatest monsters? But what does the material achieve now, in this day and age? Well, it still provides a moral cover of sorts, as do zombies and other narrative inventions we’ve turned to as a workaround for the issue of violence in games. But is it anything other than that? Does it actually change minds, educate the public, make the case for the value of human life, or provide anything other than mindless entertainment? Put another way, was Wolfenstein created, rebooted and written to tell the world Nazis are bad? Probably not. But that’s in part because we were already supposed be on the same page about that anyway. Nonetheless, the writing sends messages that are in deep conflict with one another. It’s like the game understands that Nazis are bad, but not why. In a way, it mirrors where the country is right now. We’re at a time when an entire generation that doesn’t remember World War II is coming into adulthood, and our popular framing of history has absolutely failed them. We know that the Nazis were our enemies, we know that genocide is wrong. But we didn’t address any of the ideological underpinnings behind those actions; we didn’t discuss fascism, capitalism, human rights and complicity. There are many of us that only know how to root against an enemy for the simple fact that they’re our enemy. Look at how many people rolled over on the issue of Russian interference in US politics once they found out it was benefiting their party. We know how to indulge in nationalism, root for the home team, and stick up for our side for no other reason than it’s “our side.” But we don’t know how to actually ask the right questions to make sure we’re on the right team in the first place. Maybe it’s too much to ask that Wolfenstein be more than what it is. When the series originally came out, it was just accepted that Nazis were an acceptable target. Most of us did not think there’d come a day where the designers would have to defend that creative decision. As a society, that’s a battle we thought was over. Now that neo-Nazism has reared its ugly head, it gives Bethesda a great position to market the game from. But is it actually achieving anything? If their goal is political catharsis, emotionally torturing the player sure is a funny way of showing it. The writers of Wolfenstein II do not seem to understand the position they put the audience in by writing the villains to such an extreme. For example, early in the game, Frau Engel beheads a woman, taunts you with the head and makes you kiss it several times, then laughs as it is crushed to a pulp under the Power Armored foot of a Nazi soldier. Those who are on the fence or sit on the wrong side of the moral issue at the foundation of Wolfenstein are unlikely to become self critical and see themselves in the depiction. And those who are on the right side of history will only be tortured by the material. It seems contradictory to ask players to value human life enough to hate Nazis, but be desensitized enough not to be deeply affected by how the game treats its characters. On the other hand, it’s very hard to explain to people why they should care about others. I don’t envy their position. Is it even their responsibility to educate the public on why Nazism is wrong? ...Isn’t it all of ours? 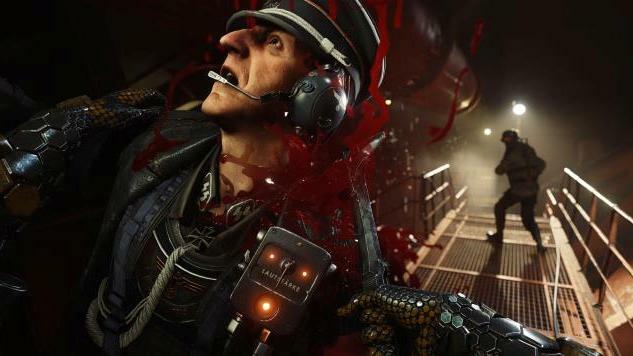 As a shooter, Wolfenstein II excels, especially in environment. The level design, the controls and the combat are all exemplary. But as for the rest, I’m stuck in hell wondering if any of this was necessary at all.